​The roller shutter garage door is one of the neatest garage door solutions available with vertical operation and no internal tracking mechanism into your garage at all. This ultimately provides you with more room on your driveway for parking and the option for additional storage space above where a standard up & over or sectional door would normally open. 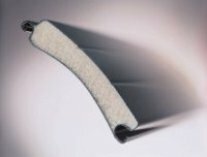 ​The whole curtain roll for many of the insulated aluminium roller doors available will usually roll into a an Aluminium box (available in many colours), this box is generally 300mm, but there is a micro roll version available which is a 210mm box ( if room is limited) in a position behind, underneath or in front of the garage lintel. 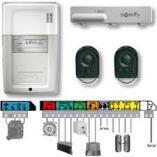 The roller door is operated via 2 remote controls as standard, or a key switch. With remote control, the door comes with a safety edge device included in the bottom of the door, if it meets any obstruction then the door will retract back up from the obstruction in question. The roller door comes in a variety of colours and grain finishes. Dont hesitate to call if you require a no obligation quote. As you can see from the diagram there is a very small installation area required, and no door retracting overhead, these doors can roll up into a 300mm x 300mm space, or alternatively a smaller 200mm x 200mm space dependant on survey. 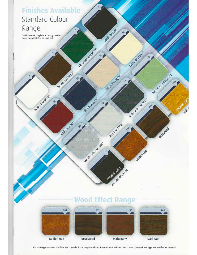 There are many colours to choose from for your roller door finish to compliment your home. Our roller doors come with remote control panel with built in light and operational buttons, courtesy light built in to the control panel, 2 x remote controls and a safety edge built into the door itself to detect obstructions. 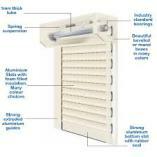 Our motors and control panels come with a 5 Year warranty for peace of mind.